This case study describes the complete steps from root cause analysis to resolution of a sudden OutOfMemoryError problem experienced with Oracle Service Bus 2.6 running on Weblogic Server 9.2. This case study will also demonstrate how you combine Thread Dump analysis and Solaris PRSTAT to pinpoint culprit Thread(s) consuming large amount of memory on your application Java Heap. An OutOfMemoryError problem was observed in our Oracle Service Bus Weblogic logs along with major performance degradation. Preventive restart was then implemented since a Java Heap memory leak was initially suspected which did not prove to be efficient. Quest Foglight monitoring tool was used to monitor the trend of the Oracle Service Bus Java Heap for each of the managed servers. You can see below a sudden increase of the Java Heap OldGen space can be observed. 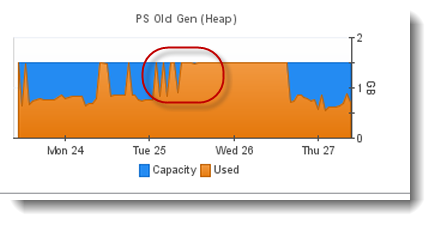 This type of memory problem normally does not indicate a linear or long term memory leak but rather rogue Thread(s) consuming large amount of memory in a short amount of time. In this scenario, my recommendation to you is to first perform Thread Dump analysis before jumping too quickly to JVM Heap Dump analysis. Thread Dump snapshots were generated during the sudden Java Heap increase and analysis did reveal a primary culprit as you can see below. Analysis of the different Thread Dump snapshots did reveal a very long elapsed time of this Thread along with a perfect correlation with our Java Heap increase. As you can see, this Thread is triggered by the ALSB alerting layer and is involved in read/write of the Weblogic internal diagnostic File Store. Solaris PRSTAT was also captured in order to understand the amount of CPU consumed and determine if this Thread was stuck or performing a lot of processing. As you can see below, Thread id #76 was identified as the primary CPU contributor with 8.6 %. Such correlation and finding did confirm that this rogue Thread was actively processing (reading/writing to the File Store) and allocating a large amount of memory on the Java Heap in a short amount of time. The above analysis along with Mark Smith Oracle Blog article finding did confirm the root cause. Oracle Service Bus allows Alert actions to be configured within the message flow (pipeline alerts). These pipeline alert actions generate alerts based on message context in a pipeline, to send to an alert destination. Such alert destination is the actual Weblogic diagnostic File Store which means this structure will grow over time depending of the volume of Alerts that your OSB application is generating. In our case, the File Store size was around 800 MB. Such increase of the diagnostic File Store size over time is leading to an increase of elapsed time of the Thread involved in read/write operations; allocating large amount of memory on the Java Heap. Such memory cannot be garbage collected until Thread completion which is leading to OutOfMemoryError and performance degradation. The reset of the diagnostic File Store did bring some immediate relief and by ensuring short and optimal diagnostic File Store operations and not causing too much impact on the Java Heap. The level of OSB alerting is still in review and will be reduced shortly in order to prevent this problem at the source. Regular monitoring and purging of the diagnostic File Store will also be implemented in order to prevent such performance degradation going forward; as per Oracle recommendations. I hope this article has helped you understand how to identify and resolve this Oracle service bus problem and appreciate how powerful Thread Dump analysis and Solaris PRSTAT tool can be to pinpoint this type of OutOfMemoryError problem. Please do not hesitate to post any comment or question. Published at DZone with permission of Pierre - Hugues Charbonneau , DZone MVB. See the original article here.